University of Kentucky freshman forward Nerlens Noel might just be the first overall pick in the 2013 NBA Draft. The problem is, unlike last year's top selection Anthony Davis, there are some glaring downsides to Noel's game. He picked up his second foul with more than six minutes remaining in the first half of Kentucky's 69-52 loss to Florida. This SnapCall asked whether UK head coach John Calipari would sit his freshman star for the remainder of the half. Any top draft choice should have the wherewithal to avoid committing more fouls after picking up a couple of early whistles. However, as the SnapCall answer indicates, Calipari pulled Noel. Clearly the Kentucky coach did not have enough confidence in his freshman's ability to play under control and stay out of foul trouble. Noel is the Wildcats' best defender and so sure enough, as soon as he was benched, Florida went on a run and finished the first half with a 13-point lead. If the Gators' run proved anything, it's that the Wildcats need their star to stay on the court, plain and simple. Unfortunately for Kentucky, Noel injured his knee and left the game with eight minutes to play. If he remains inactive for a long time, or if he returns and cannot stop picking up early fouls, Kentucky will be playing more golf than basketball come tournament time. 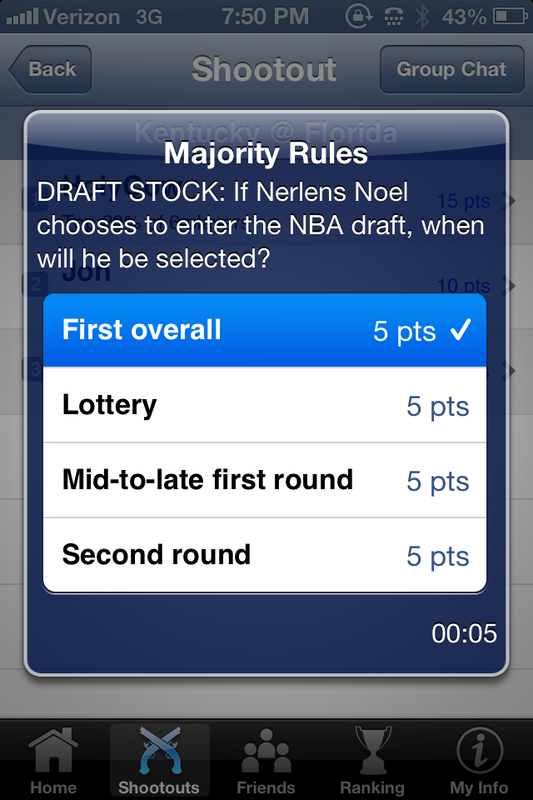 In tonight's game, we asked where you would draft Noel if you were the GM of an NBA franchise. We used our Majority Rules question type to gauge the audience's response. 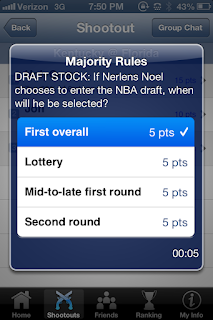 With Majority Rules, the user must guess the majority opinion to get points. Noel averages 6.6 combined blocks and steals. Even Anthony Davis only averaged a combined 6.1 last year. Noel is also shooting 59% from the field, and constantly displays his unmatched athleticism on lobs and put-back dunks. At the end of the day, it's our opinion that Noel should stay at Kentucky for another year to work on his defensive discipline and offensive post play. Make sure to download SnapCall Sports from the App Store (free) so you can join the nightly action.